A brief update. 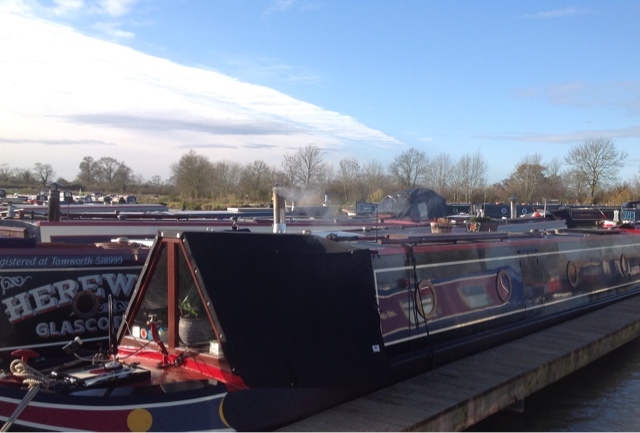 On the 28/10 we set off from Welford Junction, for the three hour cruise to our winter mooring at Yelvertoft Marina. On arrival, we used the services and topped up the diesel, before mooring on the berth we left 8 months earlier. On the 31/10 we, along with a hundred or so other Marina users, dressed up in Halloween costumes for a bit of a do in the marquee. It was a great evening. Since then we have, with the benefit of having a car available, rejoined modern society visiting shopping centres and retail parks. This past week, the weather has turned much colder and the solid fuel stove has now been lit. It will likely stay lit now until March or April, depending what sort of winter we get. Today we had a Sunday roast at the New Inn, Long Buckby, before returning to a toasty warm boat for an afternoon snooze. Tomorrow, subject to the weather we are going to escape the confines of the Marina for a couple of days. On our berth with the chimney smoking well, we have endured a few days and nights of high winds. The satellite dish has been moved from its usual spot on the roof, to the gas locker lid, to provide it some protection. This seems to have worked well, as it has not been blown off, despite some seriously strong gusts. Hopefully I will not have to deploy the very special, satellite dish retaining string this year, as it make the boat look untidy.